Pardon the Punctuation...I have to admit that the week before my trip to Cleveland I was dreading some of the nasty food I'd have to scarf down in order to survive my 10 days in town. I'll be the first to admit when I'm wrong and I was WRONG! The closest thing with CLeveland in it that ever interested me was the Clevelander in South Beach. A fellow foodie friend reminded me that Iron Chef Michael Symon is from there and he's got some wonderful restaurants to check out. Interest sparked! After doing a little online research Lola Bistro was on my radar as the place to go. Also discovered in my online research was that Cleveland restaurant week is going on while I'm in town. SCORE! For $30 I was able to have a full meal at a place where the average dish is about $27. It was a win win for me. luckily I had two friends with me who ordered other things on the restaurant week menu so I was able to taste multiple dishes. Lets break it down. Oh and by the way the wine pairing was only an additional $15..Cha Ching! I recommend the Chef's table where we sat so you can feel like part of the action too. Also good to know that there are several gluten free options on the menu. Deep Fried Bone Marrow: this wasn't on the restaurant week menu but my colleague Cheryl and I had to have it. Nothing like a little deep fried bone fat to get a meal started. Deelish but i'm sure this dish helps keep Lipitor in business. Cauliflower Soup: with bacon, golden raisin, and parsley. This was one of the highlights of the meal. Bacon was a nice touch with the sweetness of the raisins. 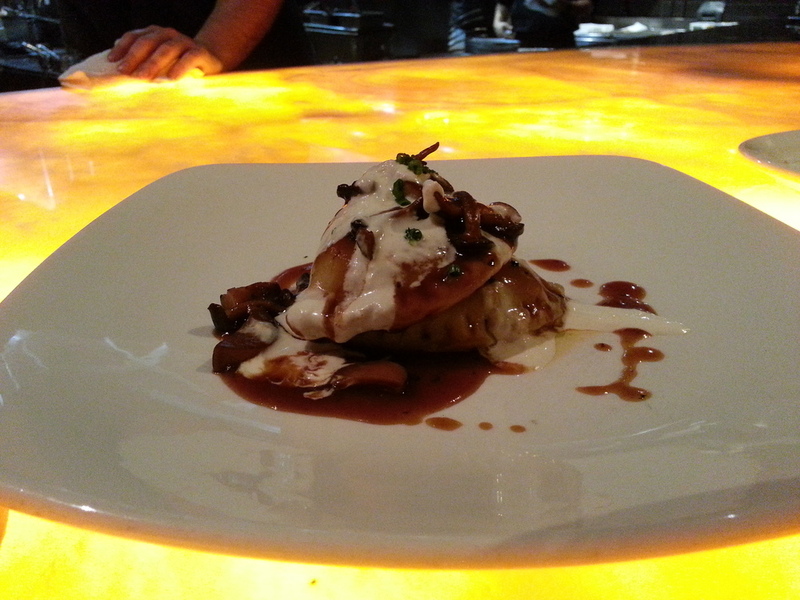 Beef Cheek Pierogi: with wild mushrooms and horseradish cream fraiche. My first time having a Pierogi and I think chef Symon has ruined all other Pierogis for me. That horseradish creme fraiche could be poured over savory pancakes as far as I'm concerned. Beef Hanger Steak: with pickle sauce, chilis, and lola fries. Perfectly cooked and the pickle sauce was a nice touch. Hint of rosemary for the fries made them heavenly. 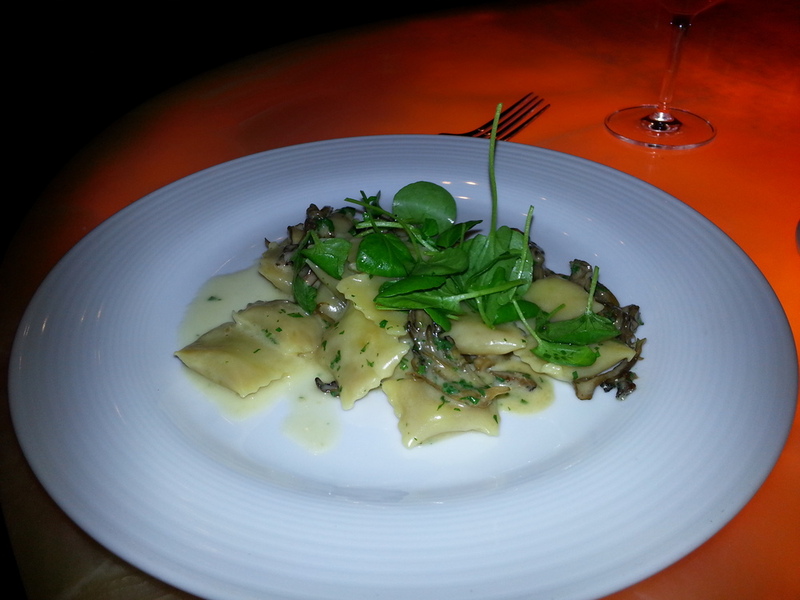 Squash Agnolotti: with maitake mushrooms, watercress, and parmesan. Cute little ravioli with a well balanced sauce and the saltiness of the parmesan giving them just the right amount of bite. Good stuff. Scallops: with Potato, leek, raisin, and country ham. Scallops are easy to screw up and these were perfect. A little seared on the top and the ham was a nice touch. Triple Chocolate Bread Pudding: with white chocolate ice cream and red wine cherry compote. This was rockin bread pudding and the ice cream worked well. It's a bit on the sweeter side which is fine with me. I'm not a fan of cherries and the compote wasn't overpowering but did tone down some of the sweetness in the chocolate. Maple Pecan Creme Brulee: with maple bacon sugar cookies. This was a surprisingly stellar dish. I know you could wrap bacon on a cat turd and it would probably taste good, but the execution of the bacon in the sugar cookie was so creative I just smile when I saw the swine shaped sweet. Complete with curly tail. Deconstructed Key Lime Pie: Not my favorite dish on the menu but it was a valiant effort. Being a Floridian it's hard to recreate that key lime flavor west of the pan handle. I'm definitely heading the Lola Bistro the next time I'm in Cleveland. This was truly the foodie highlight of my trip and shed some light on the crappy weather I was dealing with. My hat's off to you Chef Michael Symon.